Background: Immunization coverage rates in Nigeria have remained very poor, in spite of numerous programs and strategies, specifically designed to improve coverage. This study was to assess the possible effects of greater community participation on immunization coverage, by comparing the immunization coverage in a rural community with a functional community health committee, with an urban community, with no distinct community structure. Materials and Methods: The study was carried out in Ondewari, a rural, riverine community, in Bayelsa State; and Yenagoa, the capital of Bayelsa State, south-south Nigeria; using a cross-sectional, comparative study design. The data were collected using a structured interviewer-administered questionnaire, administered on female head of households in both communities, with under-five children; and used to collect information on the socio-demographic characteristics of the respondents, the immunization status of children in the household below the age of 2 years, and reasons for none and incomplete immunization. Results: A total of 288 respondents were studied in the rural community, while 270 respondents were studied in the urban center. The respondents in the urban center were significantly younger (P<0.01), better educated (P<0.001), and had fewer number of children (P<0.01). The immunization status of children in the rural community was significantly better than those in the urban community (P<0.000). Only 11.46% of the children in the rural community were not immunized, compared to 47.04% in the urban community. However, the dropout rate in the rural community was much higher; with a DPT dropout rate of 77.34%, compared to 12.39% in the urban community. 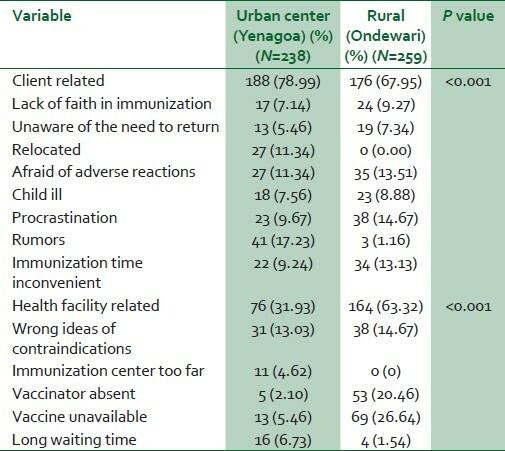 Most of the reasons given in the urban community for the incomplete immunization were linked lack of motivation, and include relocation (11.34%) and the adverse rumor about childhood immunization (17.23%), while the reasons in the rural community were mostly health facility related, and included the absence of the vaccinator (20.46%) and nonavailability of vaccines (26.64%). Conclusion: The immunization coverage in the rural community was surprisingly better than that of the urban community, which can be attributed to better mobilization and participation in the delivery of immunization services. Our suspicion is not entirely new, as suggested by the findings of other studies, , and also during the controversy that trailed the polio eradication efforts in northern Nigeria. , This was however blamed on religion and western conspiracy. , This study is to test the hypothesis in south-south Nigeria where none of these fears existed. Our study compared immunization coverage in a rural community with a functional community health committee, with an urban community, with no distinct community structure. It is hoped that the findings of this study would help refocus the immunization effort in Nigeria, in its battle to eradicate polio, and achieve universal childhood immunization coverage. The study was carried out in Ondewari, a rural, riverine community, in the Southern Ijaw Local Government Area of Bayelsa State; and Yenagoa, the capital of Bayelsa State, south-south Nigeria. A cross-sectional, comparative study design was used, with the data collected using a structured interviewer-administered questionnaire. The questionnaire was administered to female head of households in both communities, with under-five children; and used to collect information on the socio-demographic characteristics of the respondents, the immunization status of children in the household below the age of 2 years, and reasons for none and incomplete immunization. The study was designed to detect a 5% difference in immunization coverage, with an alpha error of 5%, acceptable beta error of 20%, and a statistical power of 80%; while the national average of immunization coverage of 23% was also used. Using the usual formula for sample size determination for studying proportions in populations of less than 10,000,  the minimum required sample size was thus determined to be 272, but made up to 288 to take care of nonresponses. Data analysis was by SPSS 17.0 software, Microsoft word, and Excel. Summary measures were calculated for each outcome of interest; and the differences between the communities were tested using the appropriate statistical test. For all statistical tests, P value of 0.05 or less was considered statistically significant. The approval to undertake the study was sought and obtained from the ethical review committee of the University of Port Harcourt Teaching Hospital, Port Harcourt, the Bayelsa State Ministry of Health, as well as from the Chiefs of the communities. Informed consent was also sought and received from all the study participants. A total of 288 respondents were studied in the rural community, while 270 respondents were studied in the urban center. Most of the children (253, 87.85%) were delivered outside a health facility, by a Traditional Birth Attendant, compared to 89 (32.63%) in the urban community. 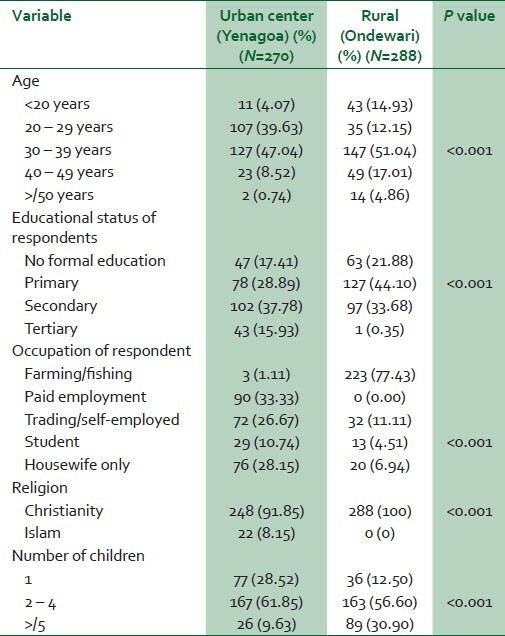 The socio-demographic characteristics of the respondents are shown in [Table 1]. The respondents in the urban center were significantly younger (P<0.01), better educated (P<0.001), and had fewer number of children (P<0.01). The average age of the respondents in the urban community was 30.84 years, compared to 33.32 years in the rural community; more than half of the respondents in the urban community had more than secondary school education, compared to 34.03% in the rural community, while the average number of children for respondents in the urban community was 2.72, compared to 3.68 in the rural community. The respondents in the rural community were mostly farmers and fisherfolks. The immunization status of the children is shown in [Table 2]. The immunization status of children in the rural community was significantly better than those in the urban community (P<0.000). Only 11.46% of the children in the rural community were not immunized, compared to 47.04% in the urban community. However, the dropout rate in the rural community was much higher; the DPT dropout rate was 77.34%, and more than a three quarter of the children (78.47%) were unable to complete their immunization, compared to a DPT dropout rate of 12.39% in the urban community. The reasons for the inability to immunize the child or to complete the immunization were assessed and grouped into client related and health facility related, and presented in [Table 3]. The respondents in the urban community gave more reasons that could be linked to their lack of motivation, while the reasons given by the respondents in the rural community were mostly health facility-related. The respondents in the urban community were more deterred by their relocation (11.34%) and the adverse rumor about childhood immunization (17.23%), while the absence of the vaccinator (20.46%) and nonavailability of vaccines (26.64%) more seriously affected the immunization in the rural community. The number of children in both communities that were fully immunized was low. It is lower than the national and south-south Nigeria averages,  and shows the effort required to achieve the target of universal childhood immunization in both communities. This is unfortunate considering that the Reaching Every Ward approach, the accelerated measles campaign, and the Immunization Plus Days (IPDs) strategy were able to nearly double immunization coverage in the country from 13% in 2003 to 23% in 2008. It is however likely that the communities in Bayelsa State did not fully benefit from these programs, since most of them were engulfed in armed youth restiveness during the period. It was very surprising to find that more children were not immunized in the urban community, compared to the rural community. This is even as the respondents in the urban community were better educated, and therefore should have better health seeking behavior. The 2008 demography and health survey in Nigeria had indicated that mother's level of education is strongly related to immunization coverage, with mothers with secondary education more than eight times more likely to fully immunize their children than mothers without education. The survey also indicated that children in urban areas are more than twice as likely as rural children to be fully vaccinated. This finding of our study is also contrary to several other studies in Nigeria, and elsewhere in the world. , The possible reasons for this could be from the reasons given by the respondents for their inability to immunize their children, and the fact that the respondents in the rural community were better encouraged to patronize the immunization services, by the effort of their community health committee. The Ondewari community in the years prior to the study had suffered a series of measles epidemics that compelled the community Chiefs and health committee to ensure that all children in the community were immunized. Several respondents in our urban community were deterred by the negative rumor about childhood immunization. This was not a big problem in our rural community, but was prominent in the other parts of Nigeria, especially northern Nigeria. ,, These negative rumors originated from outside the south-south region of Nigeria, and were spread through the mass media. This probably explains its little effect in our rural community, where the exposure to the mass media is more limited. It however identifies the need for health workers to be more proactive in responding to rumors that are potentially damaging to the utilization of important health services. The immunization coverage in our rural community was surprisingly better than that of the urban community. This can be attributed to the better mobilization and participation of the rural community in the delivery of immunization services. Greater emphasis should therefore be placed on community mobilization and participation in the effort to eradicate polio, and achieve universal childhood immunization coverage. We wish to thank the Chiefs, members of the Community Development Committee and the entire people of study communities for their assistance and cooperation during the study. We also wish to thank Professor BC Didia for his comments. We however wish to state that the opinions expressed in this article are entirely ours. 1. FBA Health Systems Analysts. The State of Routine Immunization Services in Nigeria and Reasons for Current Problems. Abuja, Nigeria: DFID; 2005. 2. Adeiga A, Omilabu SA, Audu RA, Sanni FA, Lakehinde GF, Balogun O, et al. Infant immunization coverage in difficult-to-reach area of Lagos metropolis. Afr J Clin Exp Microbiol 2005;6:227-31. 3. WHO, UNICEF, World Bank. State of the world's vaccines and immunization. 3 rd ed.Geneva: World Health Organization; 2009. 4. National Population Commission (Nigeria) and ORC Macro. Nigeria Demographic and Health Survey 2008. Calverton, Maryland: USAID; 2009. p. 20-2. 5. Shimp L. Strengthening Immunization Programs: The Communication Component. Published by the Basic Support for Institutionalizing Child Survival Project (BASICS II) for the United States Agency for International Development. Arlington, Virginia: BASICS II; 2004. 6. WHO. Declaration of Alma-Ata. International conference on primary health care. USSR: Sept 6-12 1978. Alma-Ata. 7. Zakus JD, Lysack CL. Revisiting community participation. Health Policy Plan 1998;13:1-12. 8. Cassell JA, Leach M, Fairhead JR, Small M, Mercer CH. The social shaping of childhood vaccination practice in rural and urban Gambia. Health Policy Plan 2006;21:373-91. 9. Atkinson J, Vallely A, Fitzgerald L, Whittaker M, Tanner M. The architecture and effect of participation: A systematic review of community participation for communicable disease control and elimination. Implications for malaria elimination. Malar J 2011;10:225. 10. Akande AA, Akande TM. Polio eradication in Nigeria: controversies and way forward. Afr J Clin Exp Microbiol 2006;7:173-9. 12. Araoye MO. Research methodology with statistics for health and social sciences. Ilorin: Nathandex Publishers; 2003. 13. Odiit A, Amuge B. Comparison of vaccination status of children born in the health units and those born at home. East Afr Med J 2003;80:3-6. 14. Nair TN, Varughese E. Immunization coverage of infants: Rural-urban difference in Kerala. Indian Pediatrics 1994;31:139-43. 15. Owais A, Hanif B, Siddiqui AR, Agha A, Zaidi AK. Does improving maternal knowledge of vaccines impact infant immunization rates? A community based randomized-controlled trial in Karachi, Pakistan. BMC Public Health 2011;11:239. 16. Antai D. Migration and child immunization in Nigeria: individual- and community-level contexts. BMC Public Health 2010;10:116. 17. United Nations Development Programme (UNDP): Niger Delta Human Development Report: A History of Derivation Formula. UNDP; 2006. 18. Das-Gupta M, Gauri V, Khemani S. Decentralised delivery of primary health services in Nigeria: Survey evidence from the States of Lagos and Kogi. Geneva: Development Research Group, The World Bank; 2004.